I almost died the day these black bean cookies were being made and photographed for the blog. It has been in the upper 80s in Tucson for the past week or so, thus, I’ve been taking advantage of the warmth and laying out trying to get some color back into my winter white skin. On Saturday afternoon, I was doing just that….doors were open, kids were going in and out busying themselves with riding their princess cars, when I hear the oven beep for the baked cookies. Upon running into the house in my skivvies, my oldest daughter starts crying out in terror and pointing at the ceiling. I then look up and see one of the biggest, scariest-looking wasps I’ve ever laid eyes on. I am TERRIFIED of stinging insects. I once stepped on a wasp as a child, which stung my foot and left me writhing in agonizing pain for two days. My husband has also informed me to be very afraid of wasps (bless his heart for being at work on this particular day), so I am beyond petrified at this point. After garnering all the courage I can muster and shooing the girls into their room, I start swatting wildly at this behemoth of a beast (why we don’t possess a fly swatter that I can locate when needed, I do not know). Luckily, I get in a good hit, and my nemesis goes down! Hurray! For the next (literally) 10 minutes, I am in a back and forth grapple with the quarry that will NOT die! After multiple squashings with everything from couch pillows to recipe notebooks, he finally goes down hard, getting lodged between the runners of our sliding glass doors. Before finally decimating my enemy with a crumpled up piece of notebook paper, I get a good look at him and hear the final notes of what will be his last buzzing. I swear to you, this mother had a skull and crossbones tattoo in the middle of his back right below the implied one that said ‘sting or die’. Once splattered into oblivion, he was unceremoniously scraped and dumped into the trash canister, where I fear he may be currently resurrecting and plotting my demise the next time I take out a sack of dirty diapers. I truly believe he only came into our home because of the deliciousness that is this recipe. 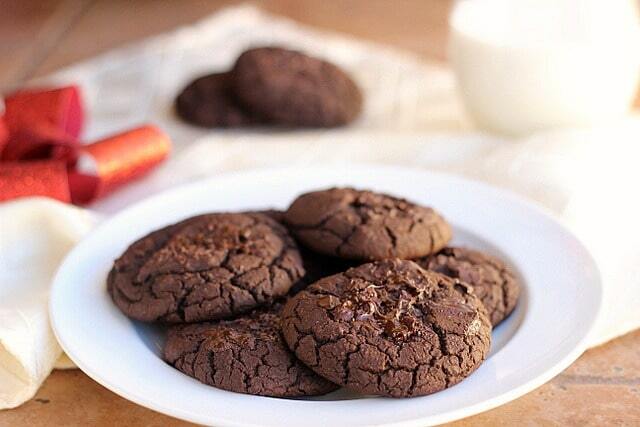 Delicious fudgy, chocolat-y cookies that taste sinfully, but are secretly made with beans. Put all of the ingredients into a food processor in the order listed (except for the chopped chocolate). Process until smooth and well combined (2-3 minutes), scraping down the sides as needed. Using a spoon, scoop the dough out onto a parchment paper-lined cookie sheet (I get 12 decent-sized cookies). 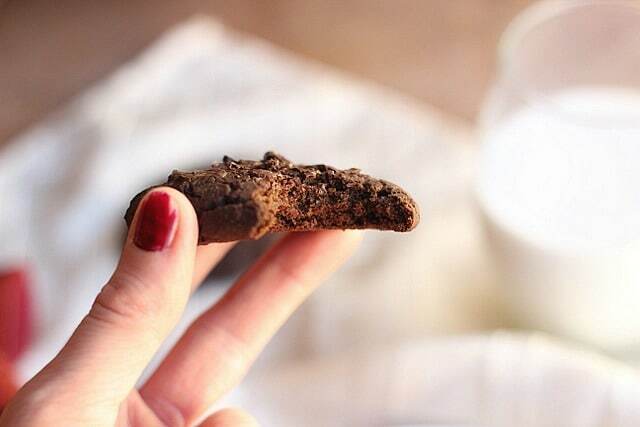 Top each cookie with a sprinkle of the chopped dark chocolate. Bake the cookies for 19-21 minutes. Cool completely. This is VERY important, as it allows the cookies to set and hold together upon being picked up, as they have no binder or gluten. Remembering back to the hedonistic eating days of my youth, I recall gorging myself on Grandma’s Fudge Chocolate Chip Cookies, which is exactly what these remind me of (as validated by my bridegroom). 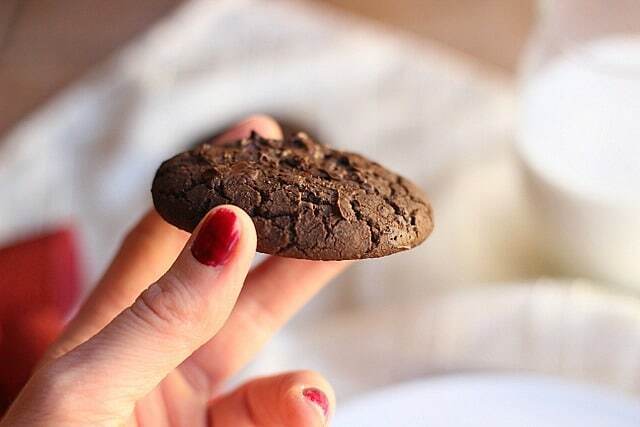 They are soft, chocolat-y, and perfectly sweet. If you so choose to embark on this baking experience, be watchful of the murderous savages that may just be awaiting entry into your fragrant dwelling. Do you have any experience with being stung by wasps or bees? What were your favorite childhood treats? These were amazing! 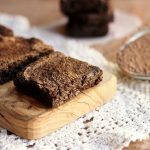 I made them with oat flour as I didn’t have brown rice flour and used molasses instead of coconut sugar. They were simply delicious! T is for tablespoon and t is for teaspoon. I hope you enjoy the recipe if you try it! I want to thank you so very much for this recipe. I credit these cookies with keeping my feed-refusing toddler off a nasal-gastric tube (which is the path we were forced down with her older sister). Protein!! In a chocolate cookie. Bless you for this recipe. They work beautifully every time &I with cannelleni beans if I’ve run out if black beans and I can raven bake it as a little loaf. Anyway. Thank you. 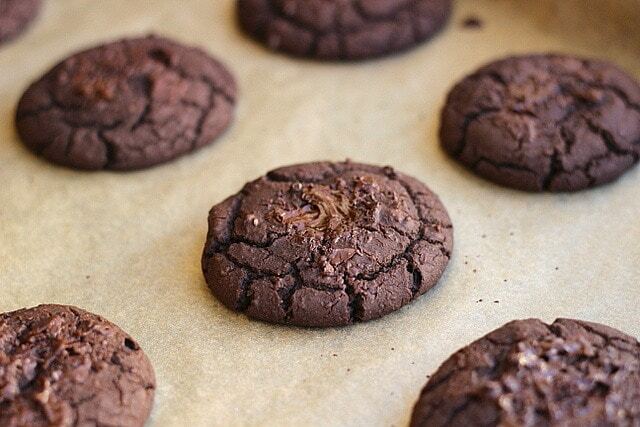 Your cookie recipe is a great idea for Passover baking when regular flour is not used. I tried this recipe with chickpea flour, because I was out of rice flour, and it was for a friend who has an allergy to eggs wheat and dairy. It’s perfect! Tasted very good, but I would like to try it with milk chocolate cocoa for myself. Thanks Claudy, I’m so happy you enjoyed them! 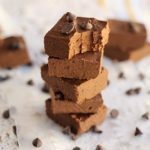 Hi if you dont want to use stevia in the recipes what would you suggest? Sorry for the delay, I would try adding another tablespoon or so of a granulated sweetener. I followed a commenter’s suggestion and used whey protein instead of brown rice powder (I was out!!! ), 1/4 tsp each of baking soda and baking powder, and only used 1/4 tsp salt. I used red kidney beans instead of black beans (once again, because I was out) and the cookies were still a beautiful dark chocolate color. Yummy straight out of the oven, and good at room temperature! 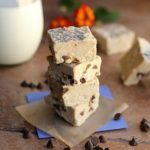 I’ve only made a few black bean cookie recipes, but this is the best one I’ve made, hands down! So happy you enjoyed them Vanessa! These look so yummy. My girls will just love these! They’re always begging me for the double chocolate chip cookies at the bakery, and I’ve been searching for a healthy alternative. I think these will be winners in my household! These were great. I used vanilla whey protein powder instead of brown rice flour and 1/4 teaspoon each of salt, baking soda and baking powder. They were great right out of the oven and did not fall apart when they were warm.Yummy!! That’s great Keri, thanks for the comment! 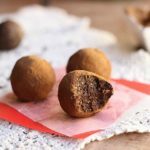 I’m new to baking with beans (but love what I have tried so far !) I really like chocolate walnut cookies , do you think if I added some chopped walnuts to the batter they would still come out ok? Just wondering if you have tried using half baking powder to half baking soda…you might get the best of both doing that. I know of other recipes that use both. I just realized I needed brown rice flour, just got back from the store…don’t want to go back. I’m looking for a grain-free recipe. Do you think coconut flour would work as a substitute? Coconut flour worked for me! I think 1/2 tsp of salt, even sea salt, is way too much. Mine were almost inedible :/ Maybe because I skipped one of the tablespoons of sugar? Hi I was wondering if chickpeas would work instead of black beans 😛 I don’t have any black beans in the house but I really wanna try make these! 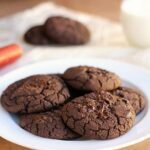 I love fudgy cookies but haven’t had any since giving up gluten… and giving up cookies as a whole during Christmas because I know what a dark, dark path that leads me down… I have to try these, they look great! We had a wasp problem in our old house – we lived in a new development with few trees and sparse vegetation and we had nests ALL over our house (and a two story house so they were hard to reach). They are aggressive little buggers. I had to laugh though at your description. Thanks for the giggle tonight. And good for you girl. I’m proud of you for going for it (despite your fear) and getting that thing of your house! Eeesh not a fun experience! I am so afraid of wasps too, I just freeze when I see them. I guess I figure if I’m not moving, they can’t see me? No it’s not logical but my muscles refuse respond! Don’t know what I’d have done in your situation! No wonder you attracted wasps. I can’t believe you didn’t attract all of the neighborhood pets with those incredible looking cookies! We had a wasp infestation. There was no shooing them out the door either. They were living in our chimney and started flying into our home in droves. I’m a vegan, but you have to protect yourself and your family! Lauren v Wasp 1-0, but you need to master your snipering skills Lauren. One hard blow, that’s really all you need. 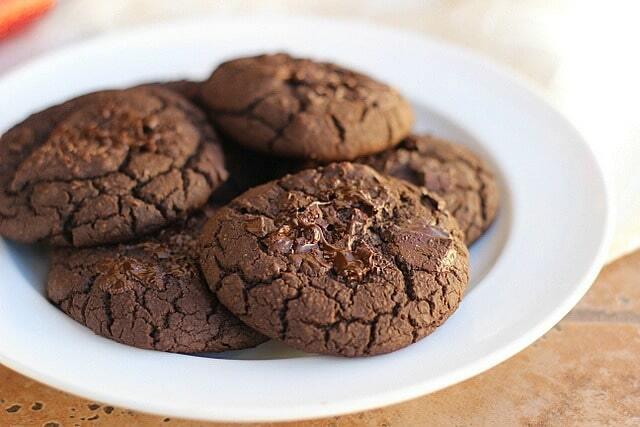 Great looking cookies btw, I could definitely use a couple right now! A vacuum would have been a great idea! We have a ShopVac that would have sucked him up so fast! the cookies look good but your story is PRICELESS! you poor thing! i think all women hate insects/bugs of any kind, but if we’re by ourselves, we get it done. Not all women hate bugs &/or scared of bugs! I’m not scared of bugs, reptiles or amphibians either! I grew up in a large family & we were big into outdoors & everything that went eith it, just so you know stereotypes & absolutes are usually inaccurate. The recipe looks great & I’m going to try it as I eat gluten-free & this recipe looks great! Im sick of eating nasty substitutes!